April marks the beginning of the South African apple and pear season. Throughout our summer, delicious varieties of apples and pears from South Africa will be available in UK supermarkets. Key varieties to look out for include the refreshingly sweet Golden Delicious apples, juicy Williams, or blushed Forelle pears. Award-winning South African chef, Reuben Riffel has created this selection of fresh, summer recipes using apples and pears from South Africa. These recipes are free to use in your publication. Contact details can be found at the end of the release. Preheat oven to 200°C, fan oven 180°C, Gas Mark 6. Combine potatoes, onions, thyme sprigs and 60ml oil in a roasting pan, season to taste and roast until starting to colour (15-20 minutes). Meanwhile, season chicken to taste and scatter with thyme leaves. Add cider and stock to the roasting pan and roast until chicken is cooked through and vegetables are tender (35-40 minutes). Stir through vinegar, serve hot. For the poached pears, stir sugar, vanilla bean and seeds and 400ml water in a saucepan over medium-high heat until sugar dissolves. Add pears halves and liqueur (if using), bring to simmer. Cover with a tight-fitting lid, reduce heat to low, simmer for 5 minutes, then cool pears completely in poaching liquid (1hour). Drain pears and thinly slice. Preheat oven to 180°C / fan oven 160°C / Gas Mark 4. Spread hazelnuts on an oven tray and roast, shaking occasionally, until browned (5-6 minutes). Rub with a tea towel to remove skins, then coarsely crush with a rolling pin and set aside. Beat butter and sugar in an electric mixer until pale and creamy, or beat with a wooden spoon until light and fluffy. Add eggs one at a time, beating well after each addition. Add milk, beat to combine, then add the flour, almonds and baking powder and fold in with a large metal spoon to combine. Spread the mixture into a large ovenproof dish (approx. 1 litre) and arrange the sliced pears on top. Scatter with crushed hazelnuts and bake for 25-30 minutes until golden and cooked through. Serve hot with crème fraiche, vanilla ice-cream or custard. In a large saucepan, bring the water, sugar, cinnamon sticks, allspice (if using) and cloves to a simmer over medium-high heat to dissolve the sugar. Cool for 5 minutes, then remove the cinnamon stick, allspice berries and cloves. Add the chocolate, cocoa powder, rum and salt. Return to heat and stir with a wooden spoon until the chocolate is melted and smooth. Poach pears separately in gently simmering water for approx 20 minutes, turning them over once halfway through the cooking process so they cook more evenly. They should be tender enough so that a knife inserted in the thickest part will easily slip in and out. 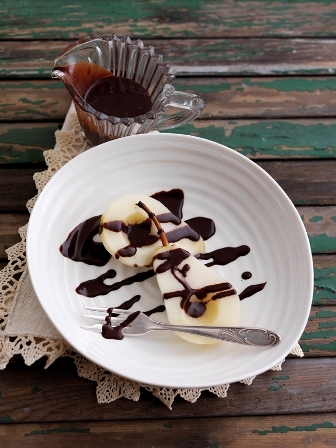 Keep the pears warm until ready to serve with the hot chocolate sauce. If not being used right away, you may refrigerate the pears in their poaching liquid in an airtight container for up to 2 days. To reheat, warm the pears in their poaching liquid in a saucepan over medium- low heat.